PART NUMBER: APD038EU. 1 x Tablet Tip. Compatibility – Designed specifically for Dell. Technical Specifications – 90 watt DC adapter; Input has 11-16 VDC (10.0 A); Output has 19.5 VDC (4.61 A max/90 W max). Model No: AC90u. Targus Universal AC wall power adapter features attractive slim design. Computer accessory features a 90-watt power output. Power adapter. 19V, 3.42 A, 65W (MAX). Output: 19V, 3.42A, 65 watts. Input: 100-240V, 50-60Hz. (Provided with 12 months warranty). Compatible with the following models (DC Connector Size: 3.0mm x 1.0mm). PA-1650-80, PA-1650-02, SADP-65KB. We will work hard to resolve the issue as soon as possible. Power your device by pairing this power tip with a compatible Targus Adapter or Docking Station. Device Power Tip (PT-X9). Venue 8 Pro (5830). Venue 8 Pro (3845). Venue 8 (3840). Venue 8 (3830). Venue 7 (3730). 3-Pin Power Cable Included. 120W Power Output. We hope you enjoy our products. Helpful Links. Tech Specs. DC Output: Up to 70W of continuous power. 1 car and plane cable. User Guide. Carrying pouch. 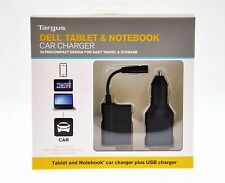 NEW Targus APD038US Dell Tablet and Notebook Car Charger Auto Adapter DC charger Charge your Dell Venue 8 or 10 Tablet, XPS 12/13, and Inspiron Notebooks when you're on the go with the Targus Tablet and Notebook Car Charger. With a compact design, connect your notebook right to the car charger for an easy charging experience. The Targus DC Universal Charger allows you to charge different notebooks or tablets by changing the included tips for your Dell notebook and Dell tablets. The charger has a 90 watt DC adapter, allowing for 11-16 VDC input and 19.5 VDC output. The mobile laptop charger includes tips to fit Dell XPS 12/13 and Inspiron Notebooks. This car charger also features a USB Adapter and USB to USB Micro Cable which allows you to connect your smartphone or Dell Tablet via the Micro USB port to charge. POWER ADAPTER PLUGS ALLOW YOU TO CONNECT TO FOREIGN OUTLETS, BUT DO NOT CONVERT POWER - ENSURE THAT YOUR COMPUTER'S ASAPTER IS RATED TO HANDLE BOTH 110 AND 220-240 VOLTS STANDARD. POWER ADAPTER KIT - WORLDWIDE. UK AC power cord. We make buying online as simple as it can be. Bulky adapters around, you needs will be more then satisfied with this solution. 75W continuous output: Provides sufficient power for most 15/16V. Output power: 75W. Key features. 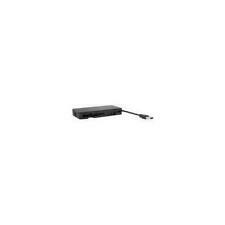 ASUS UL30A, ASUS UL30A-A1, ASUS UL30A-A2, ASUS UL30A-A3B, ASUS UL30A-X1, ASUS UL30A-X2, ASUS UL30A-X3, ASUS UL30A-X4, ASUS UL30A-X5, ASUS UL30A-QX130X, ASUS UL30A-QX131X. Genuine TARGUS AC Adapter for ASUS UL20, UL30, UL50 Series. About the item: This item is associated with the following MPN(s): NW202870. This slim notebook power cord works with your original AC Adapter to power your notebook. WE WILL BE HAPPY TO WORK OUT ANY PROBLEMS/ISSUES RELATING TO YOUR ORDER. C840, C840D, C845, C850, C850D, C855, C855D, C870, C870D, C875, C875D. Replaces 19V, 4.74A, 90W Rated Adapter. Replaces 19V, 3.42A, 65W Rated Adapter. S850, S855, S855D, S870, S875, S875D. Compatible with the following models. R423, R428, R429, R430, R439, R440, R462, R463, R464, R465, R466, R467, R468, R470, R478, R480, R507, R509, R518, R519, R520, R522, R530, R540, R560, R580, R590, R620, R718, R720, R728, R730, R780, RV408, RV410, RV508, RV510, RV511. Make the most of your USB-C device with this essential accessory. Modern devices feature fewer ports so extend the connectivity of your USB-C device with this powerful adaptor. 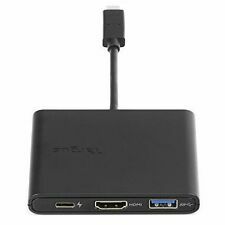 Convert a single USB-C port on your device into a power source up to 60W over USB-C, a connector for data and peripherals over USB-A and enjoy up to 4K resolution over HDMI. 90W continuous output: Provides sufficient power for most 19V based notebook devices. 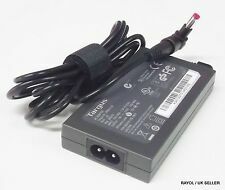 Targus 70 Watt AC Notebook Power Adapter. 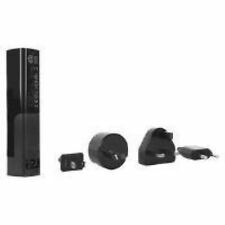 Targus AC90U 90-watt AC Power Adapter . Condition is Used. Dispatched with Royal Mail 1st Class. Power your device by pairing this power tip with a compatible Targus Adapter or Docking Station. Manufacturer: Targus Group International. Product Type: Notebook Power Tip. Maximum Output Power: 90 W.
Manufacturer: Targus Group International. Tip Letter: 3G. Product Type: Power Tip. General Information. Technical Information. During that process you will be issued with an RMA number. Manufacturer Part Number: PT-3G. 70W Mains Notebook Power Adapter. AC adapter weight 240 g. Colour of product Black. we do not take any responsibilty after this. Audio Visual. Other features. Weight 880 g. Certification TUV/CE/CISPR22 approved. Targus APA732USO 90W Notebook AC Power Adapter. 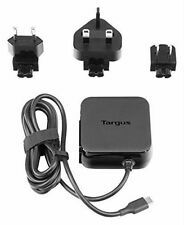 Targus APA732USO 90W Power adapter. Total: 90W max. Compatible Notebook 90-watt AC adapter. AC Power Adapter Specifications Power cord. Available power outlet. New still sealed, Targus Notebook Power Adapter - apd10eu - Universal Power Pack - (REF A1). Condition is New. Dispatched with Royal Mail 2nd Class. Any new and sealed item found to be faulty which carries a manufacturers warranty is to be taken up with the manufacturer. Device TypePower adapter - external. Targus world power connection kit - adaptors. In Targus case. 2 are missing - see card for full list of countries all adaptors can be used in. Case 10" x 7.5" closed up. I also have the TArgus modem kit listed for sale. Hard Drive Caddies. Images for illustration purposes only. Other Drives and Storage. Tape and DAT Drives. Dot Matrix Printers. CD & DVD Drives. USB/Pen/Key/Flash Drives. Drives and Storage. MPN APA32US. Output Power 19.5 Volts. Compatible Product Line See Details. IN GOOD CONDITION~. In Targus case. 1 is missing - see card for full list of countries all adaptors can be used in. Case 10" x 7.5" closed up. I also have the Targus world power connection kit adaptors listed for sale. Targus APA733USO 90W universal notebook . 1 x Versavu Case with Bluetooth Keyboard. Bluetooth removable keyboard. Type: Keyboard Case. Removable keyboard. Rechargable battery provides 90 hours of battery life. 1 x User Guide. Specifications are subject to change without notice. About the item: This item is associated with the following MPN(s): PA350U. WE WILL BE HAPPY TO WORK OUT ANY PROBLEMS/ISSUES RELATING TO YOUR ORDER. Manufacturer Targus. HP, Dell, FSC, HP, IBM, Sony and more. -Compatible with all well known manufacturers of notebook, the 90W need continuous power or less. Marke Targus. -Combined AC and car air notebook adapter. Laptop Components. Variation in these will invalidate warranty. Extended warranties available. 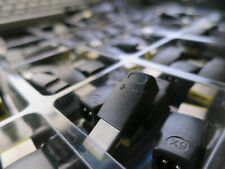 We are I.T Recyclers based in the West Midlands. In reality this is likely to be within 24 hours dependant on how busy we are. Device Power Tip (PT-3G). Product colour Black. you can buy in set of 6 max. we do not take any responsibilty after this. Monitor & TV. Desktop PC. Technical details. Why Choose Us! It allows you to plug a compatible notebook computer into airline seat with inflight power capability or into a vehicle cigarette lighter. Dual-purpose design allows you to power your notebook from an airline seat with inflight power capability or a standard cigarette lighter plug. About the item: This item is associated with the following MPN(s): AC90U. WE WILL BE HAPPY TO WORK OUT ANY PROBLEMS/ISSUES RELATING TO YOUR ORDER. About the item: This item is associated with the following MPN(s): PAPWR200U, PAPWR200U-USAA. Simply connect the PAPWR200U to the DC outlet in a car, RV, boat, or airplane and you have instant power source for your electronic device. Targus Compact Charger for Laptop and USB Tablet (APA042UK) .